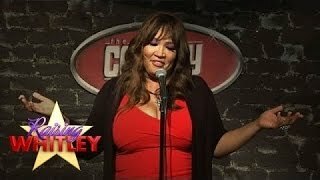 Kym Whitley is one of those rare individuals to whom the phrase “renaissance woman” might be applied. These days, the majority of people know her either from her frequent appearances on Larry David’s groundbreaking HBO series Curb Your Enthusiasm or from the Tom Joyner Morning Show, a nationally syndicated radio program. But that’s only the tip of the iceberg. Kym is actually a comedienne, actress, activist, author and — perhaps most importantly — a mother. She got her start nearly three decades ago now. Originally from the Cleveland area, Kym has been based in Los Angeles for years. She was a schoolteacher in Compton back in the day but always loved performing and, especially, comedy. A chance encounter with the legendary Redd Foxx (who told her she had “the comedic goods”) led her to pursue acting more seriously. Her first real job was in the Shelley Garrett play Beauty Shop, which started in L.A. and wound up doing a national tour. Her TV career began a few years later, in 1992, but really took off during the second half of the decade. In the mid-to-late ‘90s, Kym appeared in Married with Children, Moesha and The Wayans Brothers Show (among others). Of the latter series, she says, “My favorite was The Wayans Brothers Show. I laughed through the whole thing!” Just last year, she was nominated for a Daytime Emmy Award for her portrayal of “Big Candi” in The Bay, The Series. Kym is also no stranger to the big screen. Her first big role was as “Auntie Suga” in the 2000 film Next Friday. Since then, she has appeared in The Nutty Professor, Along Came Polly, College Road Trip and dozens of other films. She also voiced the character “Melonee” in 2011’s Rango. In addition to all her work as an entertainer, Kym is a dedicated activist. Her ‘Don’t Feed Me’ campaign started out as something she did for Joshua but evolved into an ongoing, high profile project to raise awareness of food allergies for children and adults. Kym holds an honorary doctorate from UVa — Lynchburg and serves on the boards of both The Jefferson Homes Adoption & Foster Home and The Special Needs Network. Follow Kym Whitley on Facebook, Instagram and Twitter @kymwhitley and visit “Don’t Feed Me”.org [www.dontfeedme.org].